"There's something big here." IFC Films has debuted the new official US trailer for Romanian filmmaker Corneliu Porumboiu's latest feature The Treasure. Porumboiu is most well known for his award-winning films 12:08 East of Bucharest and Police, Adjective, and this time takes on small time adventure when a peaceful man becomes obsessed with treasure buried in his garden. The film stars Toma Cuzin, Adrian Purcarescu, and Corneliu Cozmei. It premiered Un Certain Regard at the Cannes Film Festival and won the "A Certain Talent Prize" for the masterful narration. It seems to have a unique dead pan vibe with some wacky things going on in this man's pursuit for treasure, which seems to be more about his own happiness. Costi (33) leads a peaceful life. At night he likes to read his 6-year-old son stories, to help him sleep. Their favorite is Robin Hood. Costi sees himself as the hero – righter of wrongs and defender of the oppressed. One evening, his neighbor pays him an unexpected visit and shares a secret: there’s treasure buried in his grandparents’ garden, he’s sure of it. If Costi will hire a metal detector to help locate it, he’ll give him half of whatever they get. Skeptical at first, in the end Costi can’t resist. He’s on board. The two accomplices have one weekend to locate the loot. Despite every obstacle in their path, Costi refuses to be discouraged. For his wife and son, he’s a real hero – nothing and no one are going to stop him. The Treasure is written & directed by Corneliu Porumboiu, of 12:08 East of Bucharest previously. This premiered at the Cannes Film Festival. 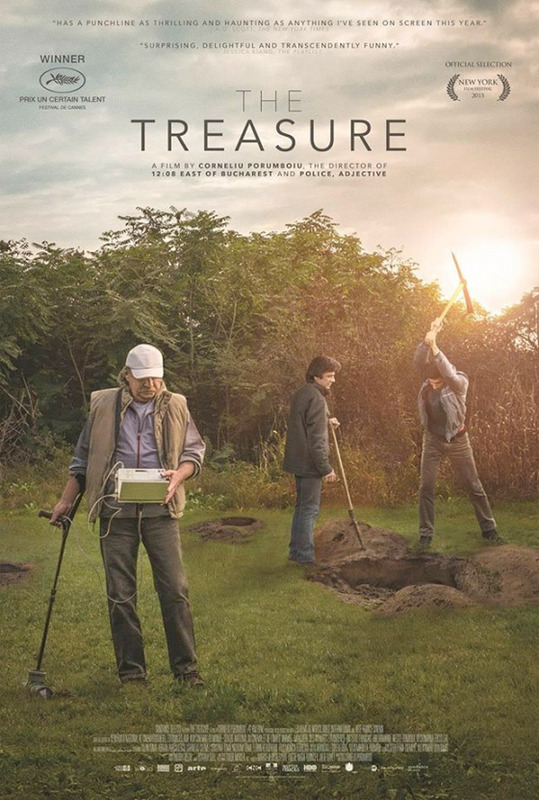 IFC Films will release The Treasure in select theaters + VOD starting January 8th, 2016. This looks cute. // Romanian sounds a lot like Italian. Yeah, also Hungarian trips me out. It sounds like German and Russian mixed. Which also makes kind of sense given Hungary's placement. Woah! Thanks for your insight, shiboleth. I love historical trivia (sorry, I know that is probably not the best word for it). I also love that whole Finnish culture/language thing. It's immensely fascinating to me. Freshness of East European flavor. Why not?